When your humble blogger here wrote (no wait, typed!) his last Music Monday post about one of the themes from InuYasha, fellow Anime@UTS club member Kirishima was so happy to have some classic anime here again, we've decided to dedicate more posts to this time period in Japanese animation! Well, the music in this time period of Japanese animation. With this in mind, let's explore this rather nostalgic (and porky) tune. It’s fitting for this time of day! While intending to write this during the morning, a certain member of the anime club who had volunteered to write the post you're reading now fell into a predictable trap that snags most university students: university work! It's as if your author is going to university for reasons other than being an active member of the Anime@UTS club or something! How stupid is that? In any event, in keeping with the time of evening this post is being written, we're taking a more relaxed tone with one of my favourite theme songs — for any series in any medium from any country ever — of all time. Everyone remembers their first Ghibli movie. Bar none. Well, other than those who don't frequent bars. Like me. Not Me, me. Stop putting words in my mouth. There's a pun about pork in there somewhere. I'll admit I watched most of Hayao Miyazaki's creative genius fairly recently, but the one movie of his I saw many, many years ago was Porco Rosso. It was one of those times where I didn't make the mental connection until years later, much like I watched Star Trek Voyager for years before realising I was a part of the fandom and went back and retroactively watched The Next Generation and and… I think we'll stop there. Of course, I would be remiss if I also didn't include this video of Eminence performing the tune at SMASH! 2007, right here in Sydney! 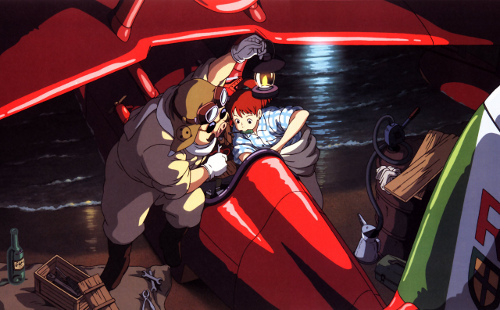 One of these days I'll have to write a full length blog post about Porco Rosso, even after seeing plenty of other Ghibli films, I'm pretty sure this one is still my favourite. Though that's not to say it doesn't have some pretty stiff competition!